Talk about star power. The combination of these two marquee actors caused a divorce, according to rumor, and shows just how caustic an alliance like this can be. When two people with this much talent and passion come together it isn’t just another day at the office, and acting isn’t just a job. Sometimes you give yourself too deeply, and sometimes that’s to our benefit. Such is the case here, so audiences should be thankful that Brad and Marion brought real chemistry to the screen; we don’t often watch a love story with as much feeling behind it. And we can’t leave out Zemeckis when we talk about the stars that aligned to make Allied; he’s been a stalwart in this industry for years. Back to the Future, Roger Rabbit, Death Becomes Her, Forrest Gump, Contact, What Lies Beneath, Cast Away, Polar Express, Beowulf, A Christmas Carol, Flight, The Walk; the guy is an under-the-radar legend, and this trio of amazing artists brought their A-game here, giving us something to enjoy for years to come. In Casablanca, French Morocco during WWII, a Canadian and a French spy would come together for a mission that would change the course of their lives. The Canadian, Max Vatan, was to pose as the Parisian husband of a beautiful woman who had already set herself up as a friend of the German socialite class. The French woman, Marianne Beausejour, was to gain her husband access to a high-up, military welcoming party for a noted Nazi diplomat. Together, the mission was to kill the man, and escape with their lives if they could. After the operation, the story really begins, as Max & Marianne fall in love and move to London to start a family. But is the situation as idyllic as it appears, and is everyone telling to truth? When both the husband and the wife are professional spies, how can trust ever be established, and how can true happiness ever be reached? Very rarely have I seen such perfect chemistry between supposed romantics on screen, and whether that’s because of their offstage antics I have no idea, and I guess I really don’t care. 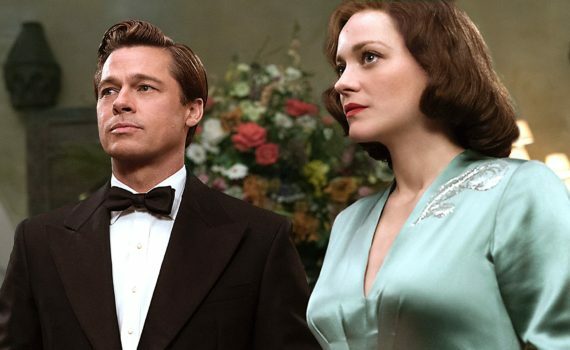 Whatever the reason, Pitt & Cotillard were a phenomenal match, not only because of their respective acting talents, but also because of something undefinable that simply glowed when they were together. I don’t mean to be cheesy, but I literally believed that they were in love, and I’m not the sappy sod who looks for that, I’m usually the cynical critic who refuses to believe it exists. Chalk that up to the greatness of the film perhaps or to excellent timing or to the leading lord and lady, but give credit where credit is due; in what was billed as a WWII movie and quickly became a romance instead, the love story succeeded in turning into something magical. Now, there were still some war elements, Allied isn’t a rom/com, but it’s much more a balanced film than even its own trailers would have you believe. The romance is the meat of the movie, WWII is the sauce, but they combine to make a delicious dish. The spy elements are very captivating, the Blitz around London extremely nerve-wracking, the flights into enemy territory crafted to remind us that war is hell, even when what you’re fighting for is something inherently good. Zemeckis was right on top of the action with a great eye, some stunning cinematography, and quality pace, weaving the story over a period of time with seamless grace. The man knows what he’s doing, he cast a brilliant duo in the lead, and the only thing that holds this film back from 5-star amazement is its own strength, the fact that it’s so solid all around, without lovable flaws or vulnerable heart to give it that extra ‘it’. Still, if that’s the only thing I can find “wrong” with it, then Allied has succeeded, and will go down as one of 2016’s top options.